The four column presses from RHTC are built with a structure of high quality steel with 4 cylindrical columns and can be used for pressing, forming and stamping in medium and high volumes. This 300 ton model is the biggest standard four column press, however these hydraulic presses can be produced according to special requirements such as bigger tonnages and dimensions. These hydraulic four column presses are provided with a double-acting cylinder with chromed piston and anti-wear guides and a motorized two-speed hydraulic unit with automatic disconnection of the high speed (speed 2). This 300 ton column press is equipped with an upper- and lower table (2.050 x 1.100 mm) with T-shaped grooves, a vertical light of 800 mm and a piston stroke of 450 mm. This hydraulic press is also provided with a pressure regulation, manometer in tons and low-voltage electric pedals for operation of the press. Our hydraulic four column presses are made in Europe and comply with the latest CE-regulations. 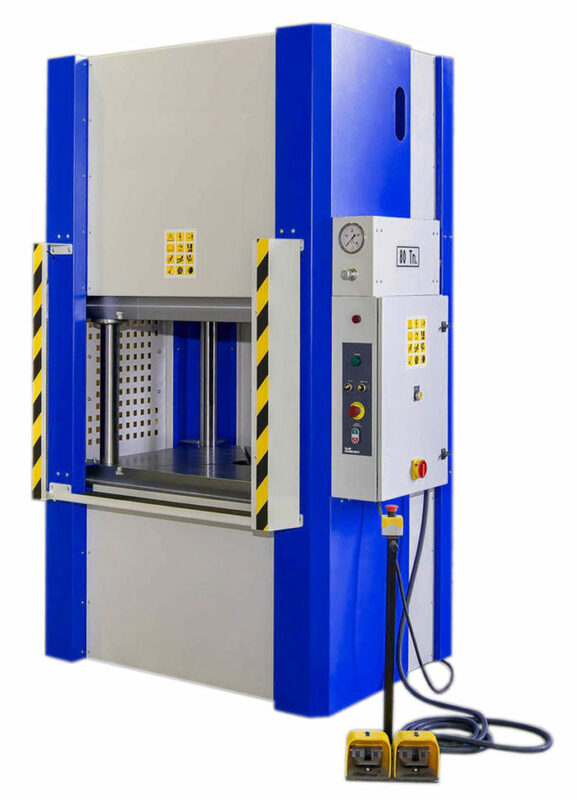 We can guarantee a high quality of these machines and therefore, these hydraulic presses with four cylindrical columns have a warranty of 2 years.